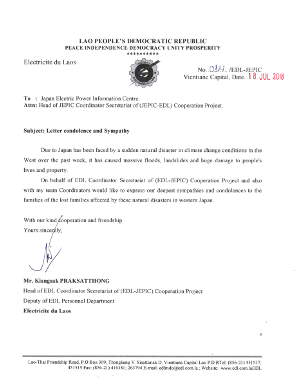 on July 2018 in Japan from Electricite Du Laos (EDL). JEPIC has been conducting bilateral seminar programs with electric utilities in ASEAN countries with strong support from the electric power companies in Japan. The programs’ purpose is to strengthen ASEAN countries’ business infrastructure such as basic and expertise technologies, management method and human resources development. JEPIC has invited participants from ASEAN Countries since 1991 (ASEAN Seminar in Japan), and sent lecturers to ASEAN Countries since 1992 (Local Seminar). From EDL, one of the electric utilities that we have been conducting the program with, we received a letter of sympathy for the Heavy Rain Event on July 2018 in Japan as follows. To; : Japan Electric Power Information Centre. Attn: Head of JEPIC Coordinator Secretariat of (JEPIC-EDL) Cooperation Project. Due to Japan has been faced by a sudden natural disaster in climate change conditions in the West over the past week, it has caused massive floods, landslides and huge damage to people's lives and property. On behalf of EDL Coordinator Secretariat of (EDL-JEPIC) Cooperation Project and also with my team Coordinators would like to express our deepest sympathies and condolences to the families of the lost families affected by these natural disasters in western Japan.